Two critical questions that emerged from the conversations at the previous edition of the Conference (IRC16) were about the digital objects of research, and the digital/internet experiences in Indic languages. As we discussed various aspects and challenges of 'studying internet in India', it was noted that we have not sufficiently explored how ongoing research methods, assumptions, and analytical frames are being challenged (if at all) by the becoming-digital of the objects of research across disciplines: from various artifacts and traces of human and machinic interactions, to archival entries and sites of ethnography, to practices and necessities of collaboration. We found that the analyses of such digital objects of research often tend to assume either an aesthetic and functional uniqueness or sameness vis-à-vis the pre-/proto-digital objects of research, while neither of these positions are discussed in detail. Further, we tend to universalise the English-speaking user's/researcher's experience of working with such digital objects, without sufficiently considering their lives and functions in other (especially, Indic) languages. How does the becoming-digital of the research objects challenge our current research practices, concerns, and assumptions? How do we appreciate, study, and theorise the functioning of and meaning-making by digital objects in Indic languages? What research tools and infrastructures are needed to study, document, annotate, analyse, archive, cite, and work with (in general) digital objects, especially those in Indic languages? This conference series is specifically driven by the following interests: 1) creating discussion spaces for researchers studying internet in India and in other comparable regions, 2) foregrounding the multiplicity, hierarchies, tensions, and urgencies of the digital sites and users in India, 3) accounting for the various layers, conceptual and material, of experiences and usages of internet and networked digital media in India, and 4) exploring and practicing new modes of research and documentation necessitated by new (digital) forms of objects of power/knowledge. 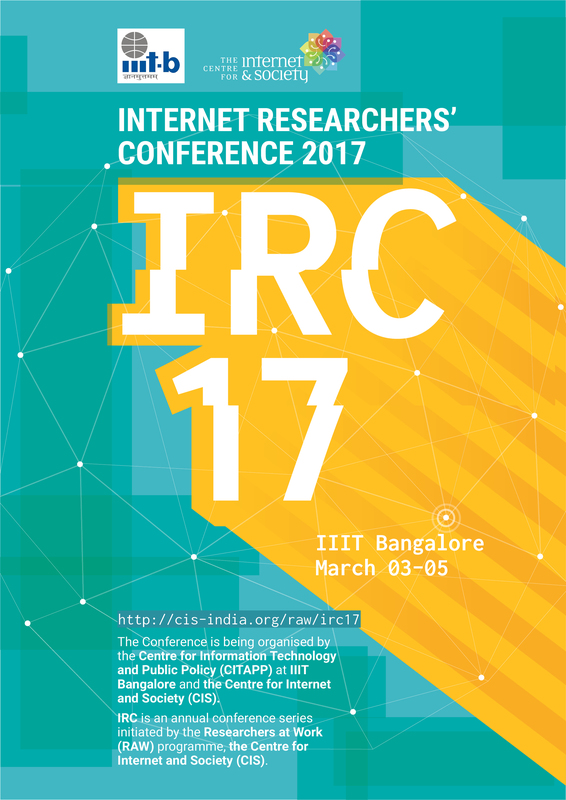 The conference is being hosted by the International Institute of Information Technology Bangalore (IIIT-B) during March 03-05, 2017. Address: 26/C, Electronics City, Hosur Road, Bangalore, 560100, location on Google Map. Please join the [email protected] mailing list to take part in pre- and post-conference conversations. The Researchers at Work (RAW) programme at the Centre for Internet and Society (CIS) initiated the Internet Researchers' Conference (IRC) series to address these concerns, and to create an annual temporary space in India, for internet researchers to gather and share experiences. exploring and practicing new modes of research and documentation necessitated by new (digital) objects of power/knowledge. The first edition of the Internet Researchers' Conference series was held in February 2016. It was hosted by the Centre for Political Studies at Jawaharlal Nehru University, and was supported by the CSCS Digital Innovation Fund. The Conference was constituted by eleven discussion sessions (majority of which were organised around presentation of several papers), four workshop sessions (which involved group discussions, activities, and learnings), a book sprint over three sessions to develop an outline of a (re)sourcebook for internet researchers in India, and a concluding round table. The audio recordings and notes from IRC16 are now being compiled into an online Reader. A detailed reflection note on IRC16 has been published.